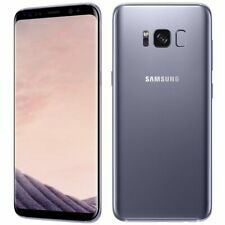 SIM Free Samsung Galaxy S8 5.8 Inch 64GB 12MP 4G Mobile Phone - Grey. It has been factory unlocked and the phone now works with all UK networks. The Samsung has been erased and reset to factory settings with the latest version of Samsung software for it installed. "9585" Simply a Product Identification Code And Is In No way Related Or relevant To the Product Listed. 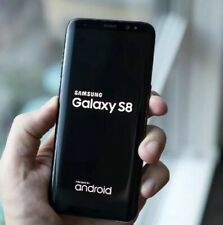 Samsung Galaxy S8 64gb IN COLOUR BLACK! UNLOCKED TO ANY NETWORK! Samsung S8! Phone does have a cracked screen and a chip at the back as you can see in the pictures. It has been factory unlocked and the phone now works with all UK networks. The Samsung has been erased and reset to factory settings with the latest version of Samsung software for it installed. The condition of the Samsung itself is in very good condition With little and minor signs of wear. For sale is a Samsung s8. (I have tried to capture it in the pictures but they do not give a good representation of the issue due to lighting reflections from the screen). Aside from this the phone works well. 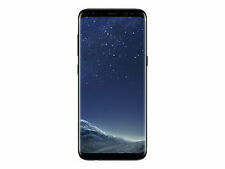 Samsung Galaxy S8 SM-G950 - 64GB - Black (Unlocked). 1 x Samsung S8. For sale is a samsung s9. -The samsung will be reset back to factory settings and wiped clean of any personal information. -The battery is still great. 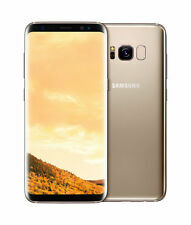 Samsung Galaxy S8 - 32GB - (Unlocked) Smartphone. Condition is Used. Dispatched with Royal Mail 1st Class. Selling my phone as listed, it is in perfect working order BUT has several cracks on screen, although noticeable they do not interfere with the way the phone works, there are also cracks and damafe to outer casing on the edges where it has been dropped, I have no use for this now as i have new one hence low selling price, with new screen or if taken care of will still last for a good good while. Have put a couple of pictures on which try to highlight the damage as best as possible. 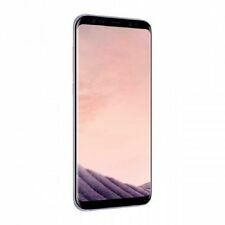 Samsung Galaxy S8 Black 64GB Please note, this phone comes with a number of flaws. As displayed in the photos, there are cracks on both the front and back of the phone screen. There are also losses of black paint on the left and right edges of the phone. Despite these flaws, the screen is still fully operational. To add, there is also screen burn-in as shown in the pictures. When the screen is white, you can see the burn-in of the keyboard as well as some features of the Twitter app. If you have any questions feel free to send me a message. Cracked front glass, screen still working perfectly. 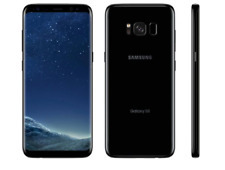 Samsung Galaxy S8 SM-G950 - 64GB - Midnight Black (Unlocked) Phone has one main scratch on screen which is near enough invisible when turned on. In overall excellent condition and fully functional. Comes with a charging cable. 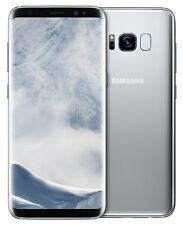 Unlocked Samsung Galaxy S8 - Orchid Grey Smartphone (Slight Screen Damage) . Slight crack to top right hand corner but this is purely cosmetic and in no way affects performance of handset. Comes complete with everything in original box except from headphones. Condition is Used. Dispatched with Royal Mail Next Day Delivery. Will post next working day from funds being received. Free pick up from Middlesbrough TS5. It has been factory unlocked and the phone now works with all UK networks. The device has been erased and reset to factory settings with the latest version of Android software for it installed. Samsung S8. Box included. New Vodafone SIM card. No reserve. Grab a bargain. Phone works. Reset to factory settings. The phone was kept in a case from new and the back of the phone has a protector on it as can be seen in the pictures. The phone is in used, good condition, there are a few little scratches on the front screen which can hardly be seen but nothing more than light wear and tare. Screen has a white line down the right hand side (see pics), you would be amazed how easy it is to ignore this and zone it out when using the handset and it does not affect the screen in any way. Phone ONLY. Samsung Galaxy S8, 64 Gb Black Cracked Screen on EE . Condition is Used. Dispatched with Royal Mail 1st Class. Standing phone case included. Condition is Used. The network is fully unlocked. The phone itself is in full working condition with good battery life. However, there is a tear on the cable from usage but this can be replaced for official cable on amazon for under £5. 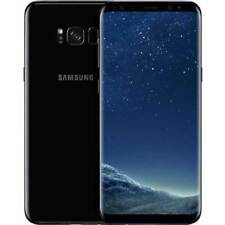 Samsung Galaxy S8 - 64GB - Midnight Black (Unlocked) Smartphone. 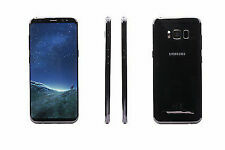 Samsung Galaxy S8 SM-G950F - 64GB - Midnight Black (Unlocked) Smartphone. Condition is Used, but in a virtually as new condition. All extras present, unmarked and virtually unused. Dispatched with Royal Mail 1st Class. For auction is my SAMSUNG GALAXY S8 mobile phone in midnight black. It is boxed with all the paperwork, accessories and charger, although the charging lead is a replacement. I have also included a Pierre Cardin leather back cover. This the 64GB version . In very good condition apart from a small knock/bruise on the top left edge of the phone, this can be clearly seen in the photographs. There are no cracks, scratches or any other damage. 99p start with NO Reserve. Sorry no 'buy it now' Will be posted 1st class signed for. Here we have for sale a Coral Blue Samsung S8 In next to mint condition. This phone is like New! Samsung Galaxy S8 SM-G950 - 64GB - rose pink (Unlocked) Smartphone. Condition is Used. Dispatched with Royal Mail 1st Class. Phone was kept in a gel case but it onviously didn't protect it from getting smashed as shown in pictures, cracks to back of screen and cracks to top left hand screen as shown in pictures phone is fully working and I am selling due to upgrade. I cant find earphones for it and little converter, comes with box ,charger and leaflets inside.